My affection for this Disney classic may stem from having the same name as the heroine herself, or from it having the privilege of being my most viewed animated film of all time, or maybe from being the earliest theater-going experience in my memory. Despite having all those personal attachments, the movie that spawned the Disney renaissance of the late 90’s is still a magical fairy tale brought to glorious big screen life, and the one that proved to audiences that cartoons could be enjoyed not just by kids, but everyone, more in the tradition of golden age Disney classics like Snow White, Pinocchio, and Bambi. The score is memorable and exciting, the first to be crafted in the shape of a Broadway musical, with such classics as “Under the Sea,” “Part of Your World,” and “Kiss the Girl.” The animation still looks great today, the underwater setting freeing the artists from the constraints of gravity, which gave scenes a free floating, dreamy quality and instantly distinguished it from the middling animated films of the previous two decades. The story was simple- mermaid princess Ariel longs to be a human, and makes a faustian bargain with Ursula, the Sea Witch( the best Disney villain since Cruella DeVil) to trade in her voice for a pair of legs, on the promise that she’ll seal her fate with true love’s first kiss. Peppered with sidekicks who also became instant Disney merchandise (Sebastian, Scuttle, Flounder, King Triton), this film was the sleeper hit of 1989, released quietly and began to build on audience word of mouth throughout the holiday season. The Disney studio was revived on the surprise success of The Little Mermaid, and was to thrive throughout the entire coming decade as the reigning king of animation once more, with hit after hit bigger than the one before it (Beauty and the Beast, Aladdin, The Lion King, etc). Disney was back on top. That is of course, until Pixar came along. Pixar has turned out so many classics in the last decade, to great commercial and critical success, that many people have compared it to the reign of Walt Disney himself. They would be right. Pixar rarely missed for a long time (although recent films indicate their streak may be over). My personal favorite from this last decade however, would be Ratatouille, for several reasons. One is director Brad Bird, who brings a personal touch to this that distinguishes it from other films, as he usually does. Director of 1999’s underrated The Iron Giant, and 2004’s The Incredibles, he almost always handles his material with a more adult sensibility, trusting his audience to be smart enough to get the joke, and purposely not catering his films to children. This particular handle on it elevates the material above your usual kiddie fare, often bringing levels to the film that kids probably won't get. Another reason this one works on a different plane is the spectacular way it transcends what it’s about. Remy is a rat who dreams of becoming a chef, who then ends up in Paris and forms a partnership with an untalented garbage boy at a French restaurant to realize his dreams. So the basic premise here is rats handling food. I know what you’re thinking, an inherently gross image that’s impossible to get beyond, but they manage to do it in this movie, by making Remy loveable and sweet, and by making the animated food still look so good. Everything looks good here, from the city of Paris, romance capital of the world, to the gourmet dishes prepared by the chefs. The underlying concept is a celebration of food and loving what you do, no matter who you are, even if who you are is a rat and what you love is the fine art of French cuisine. Peter O’Toole, funnily enough, gives one of his best performances as the voice of a snotty restaurant critic, whose final monologue on the purpose of criticism is insightful, poignant and thought provoking. For tackling a risky concept and succeeding in every possible way, Pixar and Brad Bird proved, both within the film and outside of it, that with the right amount of creativity, imagination, and love for what you do, there’s no subject that has to be off limits. Not exactly from the golden age era, but still made during Walt’s time, more of a “Silver Age” relic, if you will. This one is slightly different though, or at least it feels that way from the other Disney films produced at the time. The first Disney movie to take place in a contemporary setting, it even has a more contemporary and sly sense of humor. The animation itself was a change in style, as you'll undoubtedly notice, right from the first frame, and the change in graphics fit perfectly with the quirky British quips and atmosphere. 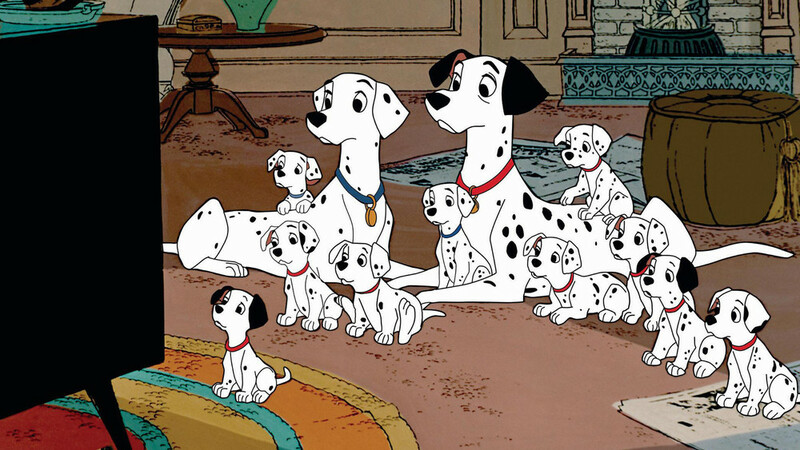 You know the story, Pongo and Perdita are the dogs whose owners marry and soon have a litter of their own. But the evil Cruella DeVil, one of the most famous and hilarious of all the Disney villains, sets out to steal the puppies for her own devilish fur coat assembly line, and now it’s up to all the dogs of London (along with the intrepid cat Tibs) to get them back. Dalmatians holds up well, and you can see the beginnings of the spatter of contemporary inside jokes that would bloom to perfection (and later, oversaturation) in the modern era. Here, watch closely and you get subtle jabs at televisions ads, game shows, music writers, dog owners resembling their pets and vice versa, and the offhand condemnation and exposure to the gruesome way furs are actually made (what’s this? A political message in a Disney movie? Well, the closest you’re ever gonna get, it was the 60’s after all). Not to mention the thrilling “prison break” by the puppies along with the exciting action and chase sequence of the final act. In my opinion, an underrated and underappreciated (for its undertones) classic of the highest order. Pixar broke through in a big way with Toy Story in 1995, and amazingly enough kept topping itself with the sequels to the same story so that it’s impossible to recommend one over the other. You simply HAVE to see them all. Toy Story was the first full length CG animated film and the one that introduced us to Woody and Buzz, those now iconic toys of Andy’s bedroom, along with Slinky, Hamm, Potato Head, and the rest of the gang. Entertaining and hilarious from beginning to end, the first one is less poignant, but probably funnier than the others. It established Woody (Tom Hanks of course) as the leader of the room, Andy’s number one toy until Buzz the spaceman shows up, threatening his favored status. Packed with jokes, memorable voice acting and chemistry between the characters, the movie was a huge hit and immediately set the precedent that animated film was going in the CG direction. It was followed by the sequel in 1999, one that saw the gang going on a quest to rescue Woody after he’s kidnapped by a toy collector. It introduced Jessie the cowgirl doll, counterpart to Woody’s cowboy, and many thought it surpassed the original in terms of story and relevance. The humor and pop cultural references were fully intact, but this time it was established that toys have a shelf life, and eventually get put aside as the kids they belong to grow up. Eleven years later, the final act showed up, and amazingly managed to stay true to the audience that had grown up with the franchise, and to its own established continuity. Exactly the same amount of time had passed in the Toy Story universe as well, with little Andy now grown and off to college, and the loyal toys getting ready to be tossed aside. This time with a prison break plot from the daycare from hell thrown in, this one was a tearjerker on the level of Bambi, if you can believe it. After 15 years of faithful audience devotion, and people who’d actually been kids when the first one came out now grown, the Pixar peeps knew it and took it all in, rewarding their fanbase with what they’d come to expect, plus emotion and poignancy on a level rarely found in film itself, much less animated film. How can a movie make you feel so much for plastic toys? The Toy Story franchise never took its audience for granted, that’s how, by the filmmakers wearing their hearts on their sleeves and managing to create in the end what very few have ever accomplished: a perfect trilogy, with not one film weaker than the others. Take my advice and watch them all in succession. By the end of the run there won’t be a dry eye in the house. It’s difficult to pick just one from the undisputed Disney golden age. You’ll have defenders for Snow White and the Seven Dwarfs, Pinocchio, Fantasia, Dumbo and Bambi equally. But I have to cast my lot in with this one. Bambi was the obvious precursor to The Lion King, with its “Prince of the Forest” cycle of life symbolism, and the trials of a young fawn followed through into adulthood. It’s a wonder to look back on now, in many ways a somber and serious tale of life in the animal forest, the gorgeous and delicate hand drawn animation sketching out the backdrop for every season with precision and aplomb. Far more subtle than The Lion King though, and with a more hard edged realism to it, as Bambi constantly faces harsh, cruel circumstances and the tribulations of that always alluded to but ultimately unseen villain- Man. The death of his mother at the hands of hunters is similarly offscreen, but the impact was felt for generations, as that moment became, along with the flying monkeys in The Wizard of Oz and the boy having to kill his own dog in Old Yeller, one of those movie moments in a film presumably made for children that scarred them forever. Still, in spite of (or maybe because of) the harsh reality of the story, Bambi is one the most renowned and deeply felt children’s movies of all time, captivating generations of moviegoers for decades, as it will undoubtedly continue to do for as long as it’s seen. If I have anything to say about it, another three generations at least.